For over a hundred years, the Angelini Shoe Company in Greenwich Village has relied on the leather produced by Vechiarelli & Son in Tuscany. This historic business partnership provides the twist of fate for Valentine Roncalli, the school teacher turned shoemaker, to fall in love with Gianluca Vechiarelli, a tanner with a complex past . . . and a secret. A piece of surprising news is revealed at The Feast of the Seven Fishes when Valentine and Gianluca join her extended family on a fateful Christmas Eve. Now faced with life altering choices, Valentine remembers the wise words that inspired her in the early days of her beloved Angelini Shoe Company: "A person who can build a pair of shoes can do just about anything." The proud, passionate Valentine is going to fight for everything she wants and savor all she deserves-the bitter and the sweetness of life itself. Romantic and poignant, told with humor and warmth, and bursting with a cast of endearing characters, The Supreme Macaroni Company is a sumptuous feast of delights: a portrait of a woman and the man she loves, her passion for craftsmanship, and the sacrifices it takes to build and sustain a family business while keeping love and laughter at the center of everything. 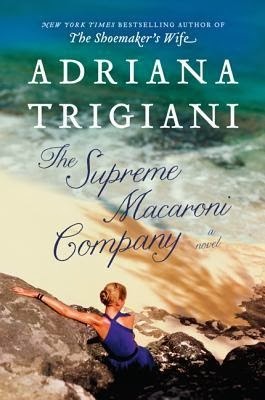 The Supreme Macaroni Company called to me, both because it was by Adriana Trigiani and because of the Italian heritage I knew would run deep in it. I'm always fascinated by glimpses into the lives of others. I also love Trigiani's ability to bring a whole family, an entire clan of loving, swearing, supportive people, to life. I was ready to get lost in another of her books. Keep in mind I had no idea this was the third book in a series. Apparently Valentine's story has been going on for two books previous to this, and therefore I was coming in at the end. On the bright side, it didn't even register that I'd missed anything at first. Valentine and Gianluca were easy to fall in step with. I was a little daunted by their age difference initially, but their family dynamic really drew me in. What kept me from falling in love with The Supreme Macaroni Company was that everything moved so quickly. Time flew as Valentine moved from being engaged, to being a married woman and beyond. I adored how much passion she had for her work. I wanted to see more of her creations. More of her personality. It all felt swallowed up by her relationship with Gianluca. Maybe if I had read the first two books I'd feel differently. Perhaps what I was missing happened in books past. All I know is that I ended the book feeling a bit cheated. It's true that it's harder to judge The Supreme Macaroni Company, simply because I didn't know this was the last book in a series. Still, I can't deny that I enjoyed the ride. The relationship between Valentine and Gianluca was bittersweet, and I did love the family as well. If nothing else I know I'll be going to back to read the two books before this.